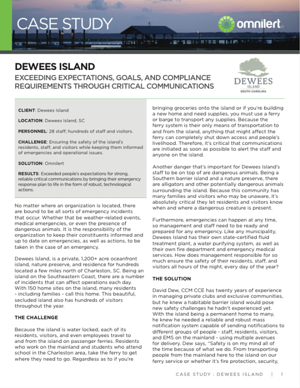 Dewees Island ensure the safety of their residents, staff, and visitors. CHALLENGE: Ensuring the safety of the island's residents, staff, and visitors while keeping them informed of emergencies and operational issues. RESULTS: Exceeded people's expectations for strong, reliable critical communications by bringing their emergency response plan to life in the form of robust, technological actions.